First, why not Grilled Chicken Salad in Pineapple Jar? For one, chicken is always a sure bet. For another, presenting it in a pineapple jar hypes it all up and thereby increases it's gastronomic value to greater levels. 1. Boil macaroni into al-dente and keep cool for sometime. 2. Season deboned chicken with salt, pepper, mustard, then grill into heated charcoal until done. 3. Combine pasta macaroni with mayonnaise, grilled chicken, carrots, celery, spring onion, raisin, pickles, crushed pineapple, salt and pepper. 4. Place on salad bowl, garnish with cucumber fan and hard-boiled egg. 5. Carve pineapple into a jar. 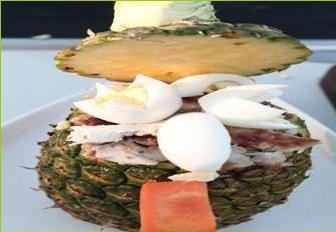 Remove half pineapple meat and place on platter, then spoon over the top of pineapple boat. 6. Lastly garnish with hard boiled egg wedges.